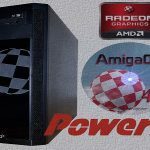 ApolloOS is a customized distribution of Amiga OS 3.9 for Vampire cards. The 32GB compact flash card image contains everything you need to get started with your Vampire card. It comes preloaded with popular software such as Personal Paint, Whdload and gaming titels such as Turran’s, OpenBOR or ZeldaROTH. ApolloOS introduces a new package management engine called “IPM” (stands for Idiotic Package Manager). When configured with the correct repository, it allows you to download and updates games, applications, videos, etc… It also allows you to upgrade to the latest release of ApolloOS. The Apollo Accelerators is an Amiga Classic accelerator board product line. It uses the Apollo core which is a code compatible Motorola M68K and ColdFire processor but is 3 to 4 time faster than the fastest 68060 at time. It also brings Amiga Classic closer to Amiga Next generation systems by offering digital video with millions of colours.Generationamiga.com is not responsible for any technical damage or copyright infringements by 3th party’s….